This event is sold out! Registration for this event is now closed. What: One-day member-only conference; open to members and Summit registrants. Where: NIH campus in Bethesda, MD. A detailed Summit agenda is now available - check out the presentations, discussions, and learning opportunities. What: A panel discussion and member networking event; open to all Society members. Note: A separate no-cost registration is required for this event. Details will be sent to all Summit registrants. Registration for this event closes April 10th. We welcome anyone working in or dedicated to the field of health communication. Our mission is to bridge the gap between public health, healthcare, digital health, academia, and research. If you work in communications, behavior change, health literacy, or related fields, we want you to attend the Summit and join the movement! Learn what’s working in health communication through inspirational examples and practical tips. Network with others in the field across the private, public, and nonprofit sectors. 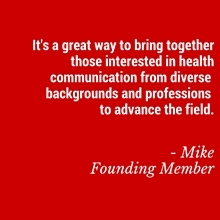 Shape our field by developing best practices for health communication. Email us at [email protected] if you have questions about the event. Follow us on Twitter @healthcommsoc for Summit updates. We hope to see you there!